Issues on the agenda included establishing a space-based environmental monitoring system, developing ‘green’ and alternative energy sources, and improving safety systems for nuclear power stations’ reactors and nuclear waste processing facilities. 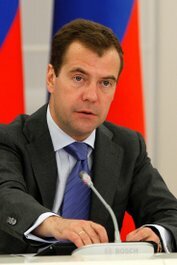 PRESIDENT OF RUSSIA DMITRY MEDVEDEV: Colleagues, we are here today to discuss the environmental aspects of economic modernisation. Not long ago, on June 9, we discussed at a State Council Presidium meeting in Dzerzhinsk the environmental problems that have built up, and the need to address them on an ongoing and systematic basis. I issued a number of instructions following that meeting, some of which are already being carried out now. The draft law on establishing an environmental monitoring system, for example, has been passed in the first reading now, and the draft law on protecting the seas from oil pollution has been submitted to the State Duma. These legislative efforts have to be completed without delay and in full. Equally important is the need to develop and spread the use of the kind of green technology that the whole world is working on now, and on which our people’s health and wellbeing are directly dependent. As far as environmental demands are concerned, we have a long way to go yet in changing people’s thinking. Business should not see these demands as something exotic, or as some kind of ‘public duty’ that they carry out only to please the authorities or not rub environmentalists the wrong way. On the contrary, these demands are a sure way of making Russian-made goods more competitive on global markets. Most countries are now working in this direction, their leaders having long since realised that innovative products must be not just attractive, interesting, ergonomic, and cheap, but also environmentally friendly. We therefore should look at how to encourage this kind of activity. In particular, we are to look at possibilities for taxing the creation of environmentally harmful waste, and using the money raised to support clean technology and the development of waste collection and treatment systems. The Government and the regional authorities must encourage the spread of this kind of technology, and all goods and services purchased through the public procurement programmes must comply with international environmental standards. I will list several promising projects that we should concentrate our attention on over the coming period. The first is the project to establish a space-based environmental monitoring system. Satellites make it possible not just to receive constantly updated information on the environmental situation, but also to track the movements of environmentally dangerous cargoes, monitor forests - especially important during the summer months - and monitor the state of glaciers, and nuclear power stations’ operation. Operating satellite systems of these sorts costs quite a lot of money though, and so we have to put in place the legal and organisational conditions making it possible to finance this work not just through state investment, as we have been doing over these last years, but also raise private investment through the means of public-private partnerships, including in environmental monitoring work. Satellites make it possible to see a lot from space, practically anything really, including our big facilities and even our waste gas flares. I know that there has been some progress on the gas flare issue, but this is not enough, and we need to look at what more we can do here, including in the matter of processing the gas associated with oil production. The second project is that of developing green energy – alternative energy sources. Given that Russia has the world’s biggest fossil fuel reserves, this kind of energy accounts for only a tiny share – less than one percent – of our total energy production. This puts us a long way behind our European partners. In fact, you could say we have done nothing really so far in this area. Germany, which is one of the most advanced countries in this respect, to take one example, plans to bring its share of alternative energy up to 35 percent by the end of the decade. Of course, we have huge reserves of traditional energy resources, but this does not mean that we should not take active steps to develop and use the potential that alternative energy sources such as wind, solar, geothermal, and other types of energy offer. So far, we have only been discussing these energy sources, and developments in the area are still only at the ideas stage. We are not talking about making use of these energy sources in industry only, but also developing their use in the housing and utilities sector too. Let me remind you that coal, oil and gas production and use as energy sources account for almost half of harmful emissions into the atmosphere today. The third area of work is to carry out pilot projects in some regions to replace local public transport vehicles with electric vehicles and develop the use of cars with hybrid engines. The pollution situation is already very serious in many of our cities, and in summer you can hardly breath. Using electric or hybrid engines could make a real difference here. Just replacing engines on public transport vehicles and trucks would cut emissions into the atmosphere by half. Of course, actually doing this is a complicated business, but whatever the case, we need to support work in this area. I also want to hear from the Government what has been done to ensure the deadlines are being met for introducing environmental regulations for petrol production and consumption. I want to say a few words separately on the climate factor in economic modernisation. We have the Kyoto Protocol, which will soon come to its term. I think we have not made full use of the possibilities it offers. We should speed up the selection and approval of the relevant projects. We are losing not just time but also the investors who could potentially enter the relevant sectors. We need to draft proposals on reinvesting the money obtained from carrying out joint initiatives directly into energy-saving and nature protection projects. I also want the Government and the Russian Union of Industrialists and Entrepreneurs to assess how well-prepared Russian exporters are for the European Union countries’ already approved and future decisions, including regarding greenhouse gas emissions. We are to pay particular attention to the nuclear sector. Russia will continue to develop nuclear energy, of course, and continue improving the safety systems in place at nuclear power stations. We must make thorough studies into the nuclear waste processing sector too, and work out exactly what the situation with this waste will be. I would like to conclude by saying one absolutely crucial thing, namely, that all the fine and worthy words we speak about the environment are worth nothing at all if they are not given real form and substance as actual state innovation and environmental development projects, and have the business community’s essential support, what’s more. This is our top priority today. We can start work now. I just want to make one announcement, and that is that I signed the law on the national payment system today. This is something this commission has discussed at past meetings, at which I have given the relevant instructions. The law sets out the procedures for carrying out all kinds of payments using electronic money and new technology, including mobile telecommunications. I hope it will be useful. найти тут . здесь лучший . в домашних условиях.